I celebrated the picking of my first jalapeño of the summer with a yummy roasted pepper purée for my grilled portabella mushrooms. I fancied a bottle that would hold up to the heat of the peppers, yet also accompany all the different vegetables we were grilling. 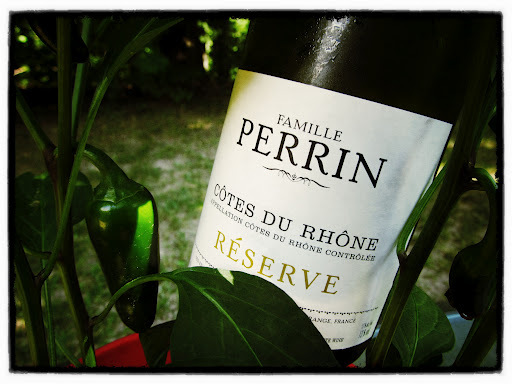 I plucked Famille Perrin Côtes du Rhône Reserve Blanc 2011 from the fridge and happily gave it a pour while our vegetables carmalised on the grill. The Perrin family has been producing wine for nearly 100 years. As owners of distinguished estates in various appellations in France, including Château de Beaucastel in Châteauneuf-du-Pape, the family has been at the forefront of innovation. Jacques Perrin, grandfather of the current generation introduced the practice of flash heat exchange. Pierre, Marc and Thomas continue on with the family tradition of innovated methods such as integrated pest control and organic farming. They strive to “show the complexity and specificity of the terroirs in the Southern Rhône”. Pale straw in colour, summery aromas of watermelon and orange blossoms rose from my glass. Fresh melon, apricot and lemon flavours abounded alongside crisp minerals in the light body. Sweet honeysuckle and refreshing bitter almond notes comprised the snappy finish. Clean and refreshing, this is a fantastic summertime glass, great on its own or with a light meal.